Positive: Good hardware; support LTE; decent speakers; fast fingerprint sensor; high autonomy. Negative: No stylus pen; poor display. Positive: Good display; decent speakers; nice design. Negative: Poor cameras. Positive: Excellent display; fast fingerprint sensor; great built quality; good speakers; nice connectivity. Negative: No USB-C. Positive: Great built quality; good screen; decent speakers; support 4G LTE. Negative: Poor cameras. Positive: Beautiful design; excellent speakers; powerful hardware; metal case; solid workmanship; compact size; decent hardware. The Huawei MediaPad M3 Lite is a tablet equipped with a total of four speakers in order to produce a vivid and powerful soundscape. 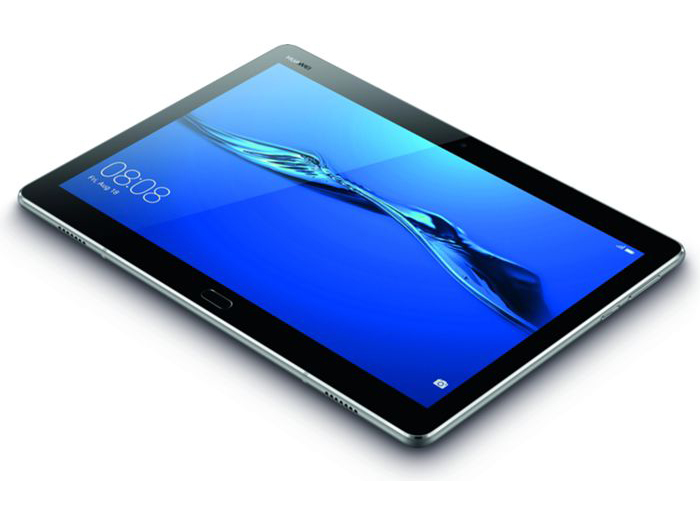 As far as Huawei tablets go, the MediaPad M3 series is top of the line. Technically, that is, since the Huawei MediaPad M3 Lite 10.0 is more like a stripped-down mid-range tablet. It is available in two different versions, Wi-Fi only and LTE. With its standard looks, the MediaPad M3 Lite is far from causing a design revolution. This is also true in terms of color, as the tablet comes either in a mix of black and grey (front and back) or entirely in white. Both models are encircled by a silver metal frame. With 32GB of storage and 3GB of RAM, the MediaPad M3 Lite 10.0 is well equipped for today’s needs. The storage can be upgraded via a microSD card, which is inserted together with the SIM card on a combined SIM/SD-card tray. The processor of the tablet is Qualcomm’s lower mid-range 1.4 GHz octa-core Snapdragon 435 SoC. Performance is certainly adequate for everyday use. The MediaPad M3 Lite’s 16:10 1920x1200 display is slightly higher and not as wide as a 16:9 display, which makes it better suited for office work or browsing the web and less suitable for watching movies. At only 413 nits, the average brightness is somewhere between mid and low-range. The MediaPad M3 Lite’s rear-facing main and front-facing secondary camera with autofocus, both with 8MP, are impressive. Huawei has installed its so-called “Emotion UI”, version 5.1, on top of Android 7.0. Most modifications are in the design, and, in general, they are rather subtle when compared to pure vanilla Android 7.0. A few updated logos here and there or the ability to select from various available themes, but also improved SmartCover detection, a quick access menu on the left side, and the ability to power the device on or off on a schedule. When multitasking, apps can be placed side by side, which makes sense on a display as large as this. By and large, users familiar with Android will feel right at home. The tablet’s low power consumption is another big plus. In standby, it barely needs any power, and it needs less power than most of its competitors when idle. With only 6.33W under maximum load, it was the most power efficient of the bunch in this load scenario. To further improve power consumption, an energy-saver mode can be enabled on demand, and the display resolution can be lowered as well. The MediaPad M3 Lite 10 is equipped with an 802.11 a/b/g/n/ac Wi-Fi chip. It is also equipped with a Cat.4 LTE modem with a maximum speed of up to 150 Mbit/s receiving and 50 Mbit/s transmitting data. 78.92%: This rating is not convincing. The laptop is evaluated below average, this is not really a recommendation for purchase.